Environmental policy is in transition. Many observers believe that the existing regulatory system, though it has accomplished great improvements in environmental quality, is approaching the limits of its effectiveness. Government regulators and policy analysts are seeking better ways to address the many issues, like non-point source pollution, that remain largely unregulated. Most corporations are seeking more cost-effective ways to meet regulatory requirements, and some leading corporations are recognizing environmental protection as part of their mission (and their image). Non-governmental organizations (NGOs) and local communities want a cleaner and safer environment, and are trying to ensure that their voices and interests are heard. “Environmental management systems” (EMSs) are emerging as an important tool in all those efforts. setting of performance objectives, employee training, documentation, and continual assessment of the system’s performance. A private certification system potentially offers objective evidence that an organization has fulfilled the standard’s requirements. Implemented conscientiously, ISO 14001 would be an excellent tool for the management of society’s environmental impacts. However, it was not intended as a policy instrument, and implemented without transparency and accountability, ISO 14001 could in fact be counter-productive. While the potential environmental benefits of the ISO 14000 environmental management standards are substantial, there are many unanswered questions about how they will be applied in practice and their ultimate effect on environmental quality. This study is the result of a two-year investigation of the development, implementation, and potential applications of the ISO 14000 series both in the U.S. and internationally, with a principle focus on the ISO 14001 EMS standard. Our goal is to clarify the benefits and limitations of the ISO 14000 standards and to evaluate their effects on society and public policy generally. 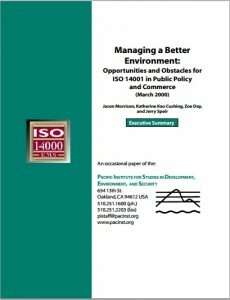 Managing a Better Environment: Opportunities and Obstacles for ISO 14001 in Public Policy and Commerce examines the standards in the context of their potential to advance the “three Es” of sustainable development – economy, environment, and equity. Our analysis covers both the creation of the standards and their implications for global commerce and environmental protection. We pay particular attention to ISO itself and argue for changes in the organization’s membership. We then discuss the ISO 14001 EMS standard – its essential requirements and its certification process – and follow that with an assessment of the benefits and limitations of EMSs. Three case studies are provided, describing the emergence of ISO 14001 as an environmental regulatory tool in the United States. Finally, we offer conclusions and recommendations on how the ISO 14000 series standards might be integrated into existing commercial practices, regulatory structures, and trade regimes in a socially equitable and environmentally beneficial manner.